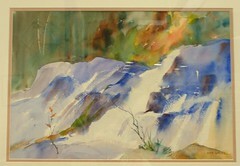 The Friday Painters’ Group of Mount Washington Valley is our Artist-of-the-Month group show for July. The Friday painters meet at various valley locations to paint local landscapes from late June to early October. All media and skill levels are welcome. Come see the great work this group is exhibiting at the library.